Q: What sort of fittings do I need for a hinged window screen? A: All our hinged doors and windows come with the fittings needed for the installation and full instructions. Q: Can you buy insect mesh on its own? A: Yes, the standard PVC mesh comes on rolls of 45m and in widths of 50mm, 75mm, 100mm, 150mm and 300mm. Wider rolls of 1.2m and 1.8m can be purchased by the metre (minium order is 3m) or on rolls of 30m, 50m or 183m. Other types are also available, see web site for more info. 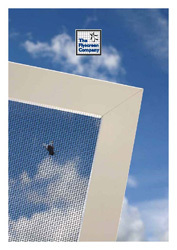 Q: How long will it take to make a flyscreen window? A: Depending on the size and quantity we will try and complete the order within five working days. A: No, if an item has been Made-to-Measure to your exact measurements we can not accept returns or give a refund. Q: I would like a flyscreen for my window but I'm not sure what or where to to measure, can you help? A: You can find all the intructions you need on our Measuring Guides page, click this link to go striaght there.